Where do you need a metal roof installed? The average roofing installation price for a metal roof costs anywhere between $21,000 to $50,000 depending on the slope, pitch, and size of your roof as well as which type of metal roof you are wanting. You can expect to pay $7 to $10 per sq. foot or $700 to $1000 per square installed on a standard sized single story home. Costs will vary depending on local roof contractor’s pricing as well. View your potential roof installation savings with local contractors below. Standing seam metal roofs will cost you about $4.00 to $6.50 per square foot.. This is the most common metal roof design due to its availability in the U.S. The design features vertical panels that are joined by interlocking seams. Corrugated steel panel roofs are the least expensive type of metal roofing, costing about $1.20 to $5.00 per square foot comparable to the price of asphalt shingle roofing. It is thin and lightweight, which means it can be installed over existing roofing. This cuts down on the costs of removing old roofing. However, the quality tends to match the price, as these panels are vulnerable to leaks and rust. Steel & Aluminum shingle roofing runs $3.00 to $9.00 per square foot. Metal roofing tiles and shingles aren’t as affordable as corrugated panels, however they are a better deal. They typically last 40 years or more and are much more resistant to leaks and rust than corrugated metal roofing panels. Stone coated steel tiles and shingles tend to cost $1.85 to $4.00 per square foot. This metal roof type allows for aesthetic diversity by offering the benefits of metal roofing with the look of more traditional clay or slate shingles. 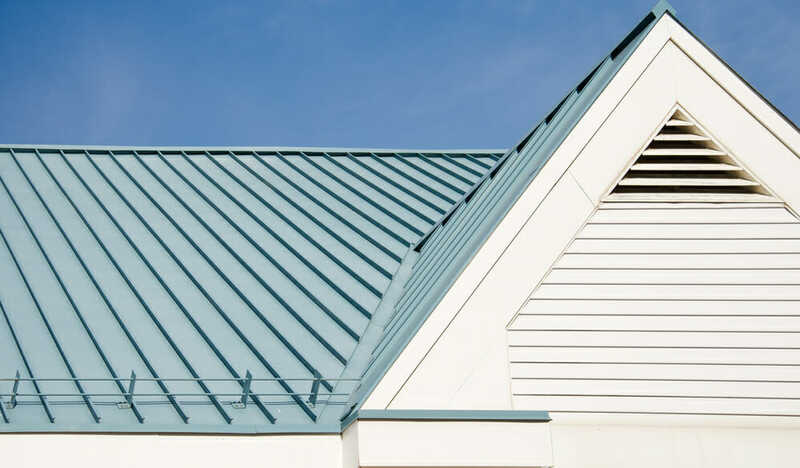 Copper Zinc Metal Roofs cost between $4.00 to $15.00 per roofing square foot, and are considered one of the highest quality metal roofing types. You can choose any paint finish you would like for a metal roof, depending on the preferred color and desired energy efficiency. Paint quality varies, ultimately affecting the price of the materials you purchase for installation. This should be included in your metal roofing quote from a professional metal roof installer. Keep in mind that underlayment and the other accessories needed for metal roofing installation tends to cost $4.00 to $5.00 per square foot. A metal roofs costs $7 to $10 per sq. foot compared to Asphalt shingles costing from 1.50 to $5.50 per sq. foot. A metal roof lasts 40 to 80 years, while asphalt shingle roofs will last 20+ years. Metal roofing also has the advantage of an 85.9% average return on home investment and lowers your insurance rate due to fire resistance compared to asphalt roofs. Here are some other benefits that metal roofing offers compared to asphalt shingle roofs. While the initial material and metal roofing installation cost of this roof type is higher than asphalt or other standard roofing materials, their longevity is far superior. They last two to three times longer than a typical asphalt shingle roofing. Metal roofing will increase the resale value of your home. Across the country, homeowners who invest in metal roofing get an average ROI of 85.9%. Metal roofing can also lower your insurance rates because of its fire resistance, especially in states like Texas and California that are vulnerable to wildfires. Though you may be tempted to skim a little off the price by hiring less expensive labor, you’re going to want nothing but a highly qualified licensed and experienced contractor installing your roof. It’s a demanding job that requires a technical knowledge base. Additionally, the old roof may need to be ripped off, which requires extra time and transportation of the used materials. Labor will cost you anywhere from $2.30 to $5.80 per square foot. Keep in mind that roofing contractors have many expenses and generally make a 25% profit from their labor. The average cost of metal roofing is $6000. You can save up to 40% in cooling costs with reflective metal roofing. You can also raise the resale value of your home. You will very likely see a return on your investment in these ways, but make sure to calculate your unique roofing costs before deciding whether a metal roof is right for your home. From the factory, your metal roof products will be coated with either zinc (galvanized) or a mixture of aluminum and zinc (galvalume or zincalume). Of those options, galvalume is the longest lasting. All coatings are available in varying levels of thicknesses. Thicker coatings will absolutely last longer, but will also cost more initially. No matter which coating you select though, at some point, long term exposure to the elements will deteriorate the protective finish and you’ll need to recoat. A simple recoat with a polymer coating (Kynar is the most popular) will restore your metal roof to like-new conditions. To wash, use simple soap and water–a hose or a pressure washer can be used, but avoid abrasive tools like wire brushes or steel wool that can scratch your roof. If you do scratch your roof, the scratched area can be wiped down with mineral spirits and touch up paint can be applied with a paintbrush. The long-life of your metal roof can be enhanced with proper maintenance. Traditional roofing products contribute an estimated 20 billion pounds of waste to U.S. landfills on an annual basis. Metal roofing systems are more eco-friendly options as they are made from 30-60% recycled material (and is 100% recyclable) and can be installed over an existing roof, eliminating the out-of-pocket cost, as well as the environmental impact of taking off and disposing an old roof. Most metal roofing products make use of reflective pigment technology, making your home more energy efficient and decreasing your monthly utility bills by up to 40%. Reflective pigment technology comes in the form of a simple coating that enables metal roofs to reflect heat in the summer, while providing superior insulation in the winter. Metal roof systems provides long-term energy savings, while decreasing your overall environmental impact. If you are unfamiliar with metal roofs, you may have concerns about the potential for rust, noise from rain and wind, and denting, but rest assured that modern engineering addresses these concerns. Additionally, some believe that metal roofing will increase your likelihood of a lightning strike. While metal does conduct electricity, electricity is not drawn to it. In fact, because metal roofing is fire resistant, if your home is struck by lightening, your risk of fire is actually decreased with a metal roof. Finally, a metal roof will not make your home colder in the winter. As long as your attic is properly insulated, your home will stay just as toasty as any other home in the winter.